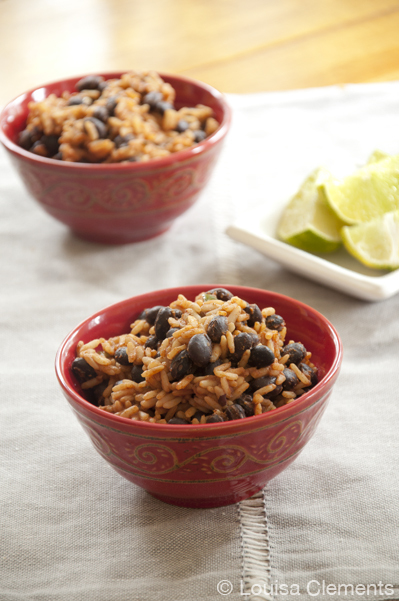 Make the perfect side for Mexican night with this simple and healthy recipe for rice and beans. A couple of weeks ago, I was asked to take part in something called “The 10 Day Consumer Challenge” basically, you’re only supposed to buy necessities for ten days. You know what that means…no movies, no chocolate bars for that 5pm chocolate craving (no, it is not a necessity!) and no ordering in dinner – it’s a lot harder than it sounds. Until finishing the challenge, I never realized how many things I buy on a regular basis that are completely unnecessary. I mean, did I really need that burrito during class the other day or was I just bored? And as much as I love seeing movies on the weekend, maybe a couple of nights a weekend, I should just watch what’s on TV. 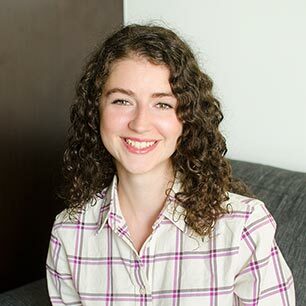 I saved a heck of a lot of money by only purchasing what I needed and not what I wanted – I’m going to try and implement a few of the “10 Day Consumer Challenge” principles on a regular basis – as a college student, I can’t get enough of saving money. What the challenge also had me thinking about was pantry staples – and the meals you can create from items already stocked in your pantry. I couldn’t even tell you the amount of times I look in my pantry and walk away saying there is nothing to eat or to make for dinner. In reality there are cans of beans, tuna, crushed tomatoes, diced tomatoes, rice and pasta. About halfway through the challenge I was a little uninspired by the ingredients in my pantry, but knew I couldn’t go out and buy anything because I had everything I needed for a good meal at home, that’s where this Rice and Beans recipe came from. It was super quick and filling, plus I had lots of leftovers for lunch and dinner the next day. It works great as a side dish or even as a main course because the black beans add a ton of protein. A simple side dish perfect for Mexican night. Add rice, stirring to coat in oil. Toast rice for 1-2 minutes. Add the garlic and jalapeno, stirring to combine with rice. Cook until fragrant - about a minute. Stir in spices and oregano. Add water, tomatoes and black beans. Bring to a boil, cover and turn off heat. Steam for 20 minutes or until liquid has been absorbed and rice is cooked. Serve as a meal or with your favourite Mexican foods like my favourite Shredded Chicken Tacos. I challenge all of you to try out the “10 Day Consumer Challenge” – let me know how it goes! Did you find any changes? I don't drive so stopped shopping for the most part. And my hubby and I live on a tight budget, so mostly don't buy prepared food or beverages out. I know all that can add up. A group of ladies from bible study went to lunch and I was pretty much horrified at the prices at the fast food joint and we all had coupons to use! This recipe looks TO DIE FOR and it's such a plus that it's super simple to make and looks delicious! This would make for a great dish at a mexican fiesta themed dinner with some close friends! First of all, I love the photo of your delicious looking "Rice & Beans"...I am trying to eat healthier & this would be a great dish to start with, but I would be leaving out the jalapeno, altogether...I don't particularly care for "spicy hot food" in my mount...I do eat it if it served to me & my mouth adjusts to it but I don't cook with it for myself...I know, I'm a big wimp! I'm sure it'll taste just as great without the jalapeno! Made this today for lunch, using brown rice because that's what I had. Added a dollop of sour cream to my bowl. Delicious! The only thing I might change is adding another jalapeno next time-- or leaving the seeds in. I was hesitant of the heat, but I think I can handle more next time. Would you be able to substitute with brown rice ? If so, would there be any changes made to the measurements ? Hi Bianca, you can definitely substitute in brown rice. You'll have to cook the brown rice according to the package directions (I think usually about 40 minutes, but don't quote me on that)- also, I would add in the black beans at the end instead of cooking them with the rice so they don't end up being mushy. Wow this looks absolutely delicious, but not too difficult to make as well! Might try it tonight actually. Thank you, let me know if you give it a try! If I don't have tomatoes should I adjust the recipe somehow or can I leave them out and all will be good? Hi Taylor, I would add another 1/2 cup of water (for a total of 2 cups) so you have a 2 parts liquid to 1 part rice ratio. Your rice won't have the same colour as the one in the photo, but I think it should still be good. You could also add a couple of tbsp of tomato paste if you have that on hand (in addition to the water). Let me know how it goes!